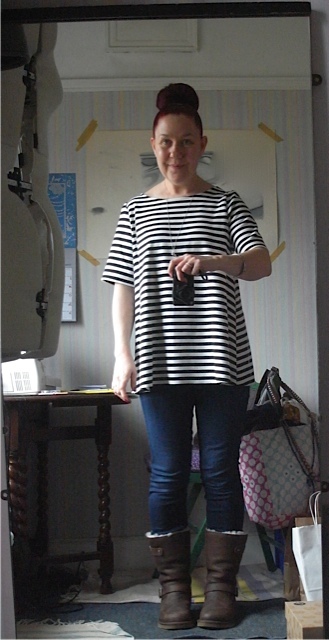 I’ve gone back to my old tried and tested rectangle top. 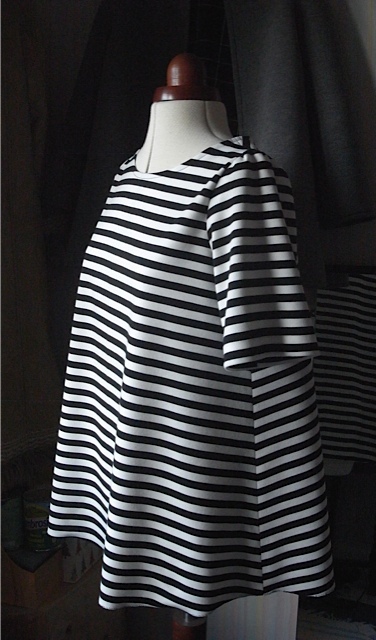 I have learnt so much since making my first top, that although this is a very basic shape and very easy to make, there has been a lot of thought that has gone into the making of this top. The fabric is a viscose/crepe type, and its thicker than I imagine it is every time. I always think of it as being quite flimsy and delicate, and its really not. Handles really nicely. I bought this one a year ago but have been too scared to use it. I tried about 8 months ago but when I pinned the pattern to the fabric the fabric just moved all over the place. So I gave up and put it back in my fabric pile. 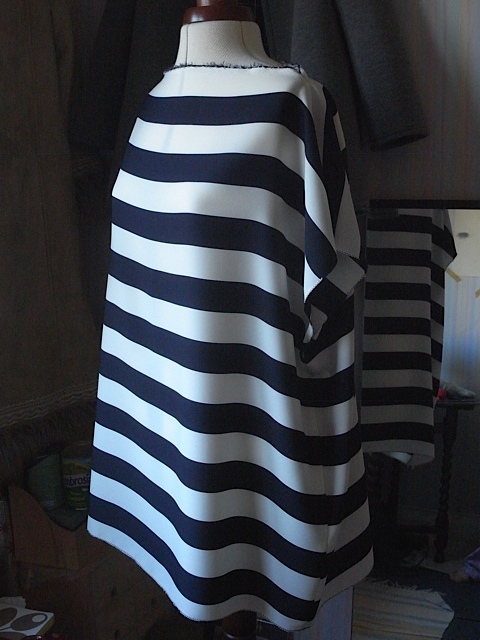 I wasn’t too sure how to use this fabric for a couple of reasons, one being that it was going to be tricky to pin a pattern to and cut it out, and the other being that the stripes didn’t run horizontally from selvedge to selvedge, but ran vertically. 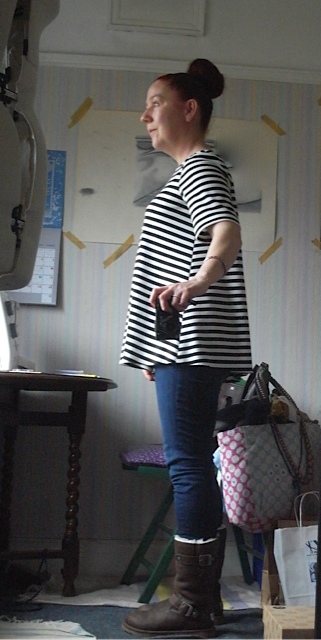 I did not want a stripe top with vertical stripes. So the fabric has sat there for best part of a year. 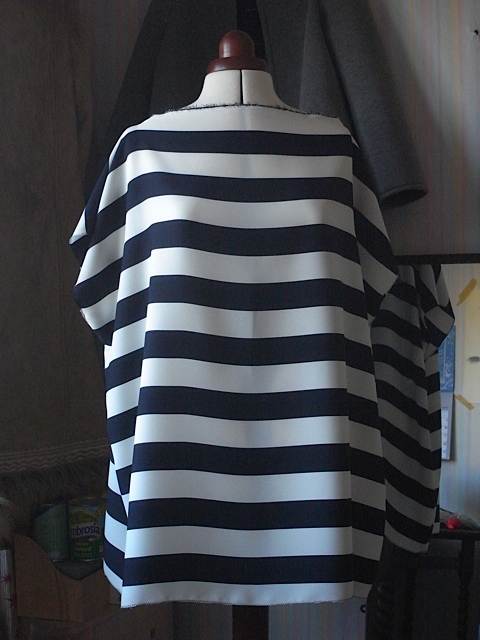 Now that I’ve started my little love affair with stripes I was ready to tackle this fabric again. I really can’t remember how much I bought but I do know it was 150cm wide, I think I only bought a metre but it might have been a metre and a half, and it wasn’t at all expensive. £4 a metre to be exact. I decided to fold it with the raw edge running down ,if that makes sense? 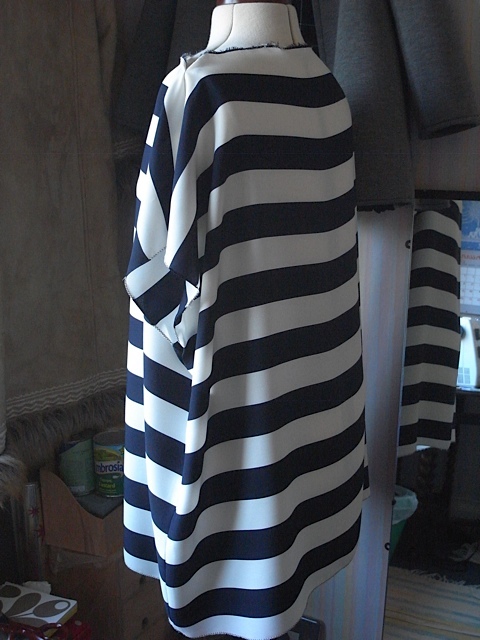 So that the stripes would run horizontally. As the fabric has no stretch in it whatsoever this has worked out quite well. 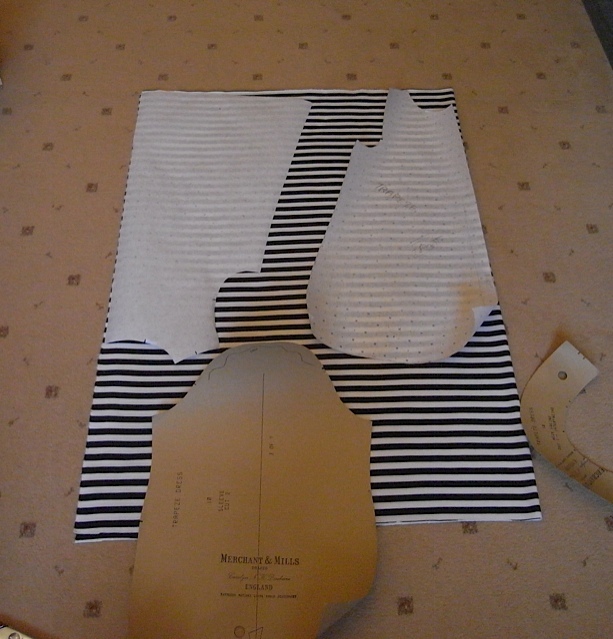 It was much easier to cut out not having an actual pattern to cut round. It took me a little while to remember exactly how I made these rectangle tops but I got there in the end. I decided to make this one a little wider than the ones I’ve made in the past, as I felt the fabric would probably drape quite nicely. I aslo incorporated the selvedge into being part of the top and have used as a bit of design feature, I’m really happy with how it looks and think it works very well. 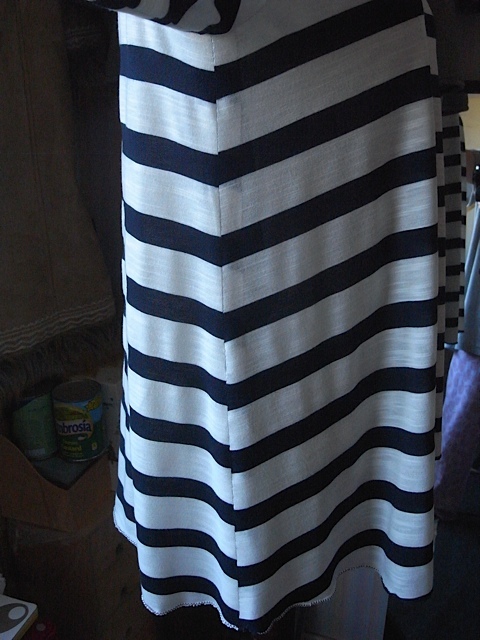 And I have once again left the bottom edge un-hemmed and just zigzagged it. 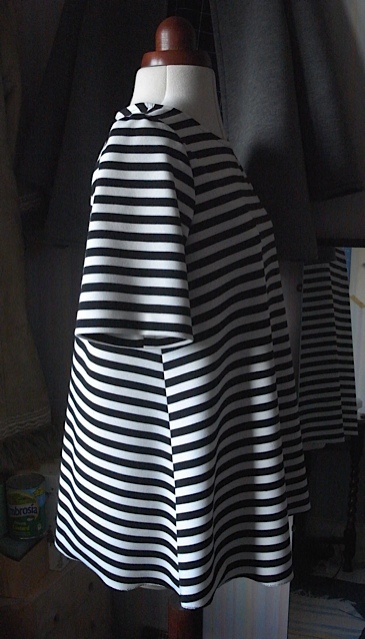 I had to be really careful with stripe matching at the sides. 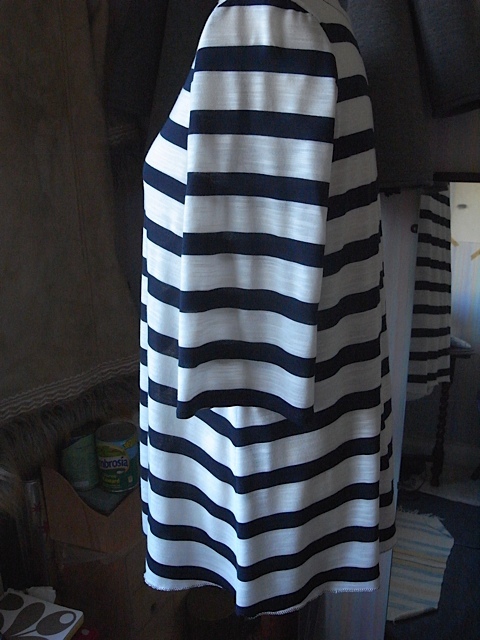 As this is such a large stripe I think it would have looked so bad if they had been mismatched. It took some time and effort but it paid off. So lovely not having a centre back seam to worry about. I love how it drapes. See what I mean about the selvedge. I particularly love that it ends with the navy colour. What do you think? This might not be everyones cup of tea, but I’m so happy with it and I love it. 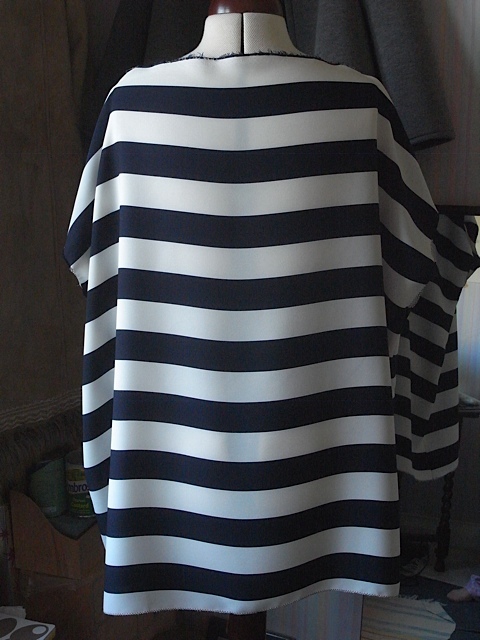 In my opinion its a very stylish tunic that will be perfect for evenings out or nice lunches with friends. 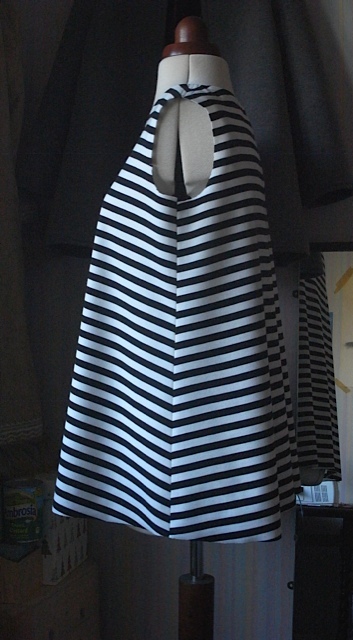 So comfortable and easy to wear, whats not to love? 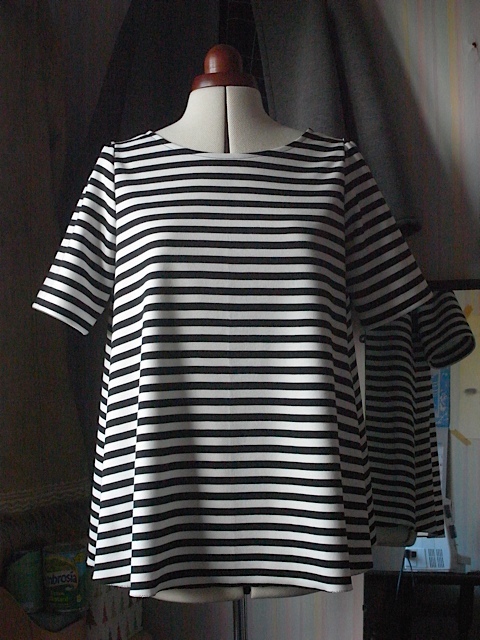 I also love that I can make this style of top in just a few hours. 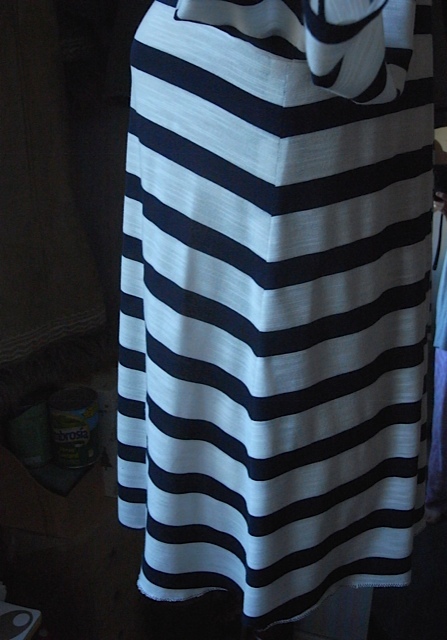 Stripes, yep, stripes are definitely my new favourite thing. And look at this gorgeous fabric. 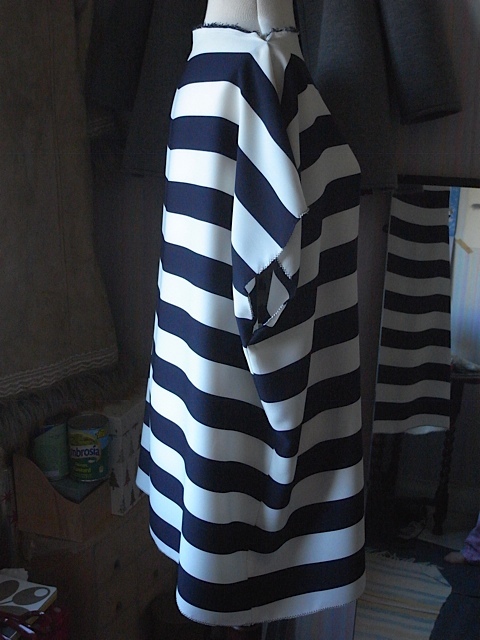 I bought it about 9 months ago, along with the stripy fabric from the last top I made. Both came from fabric godmother.co.uk. 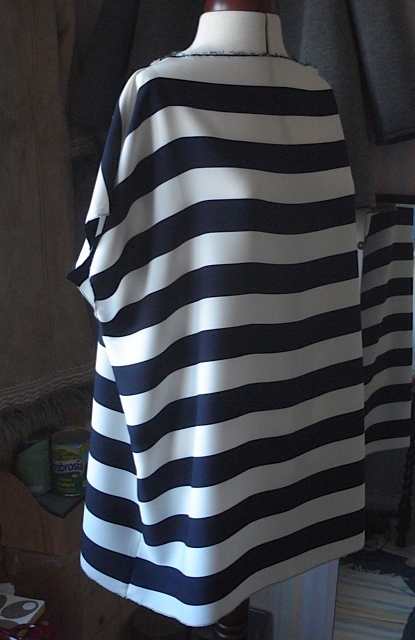 Its the same Trapeze top pattern, and once again it was a fairly quick make as no seams to finish. This is why I love jersey. I thought it might be more of a problem than the last one as the fabric is a finer jersey and I thought it might misbehave a bit, but it didn’t. So I’m very happy about that. Can’t complain too much about the stripe matching. Always more luck than judgement. This side not quite as good. Back gone a little off half way up! Don’t know quite what is up with that. Quite like how the sleeve stripes line up with the body stripes. I’m sorry the modelling pics are so dark, but it was dark when I took them. 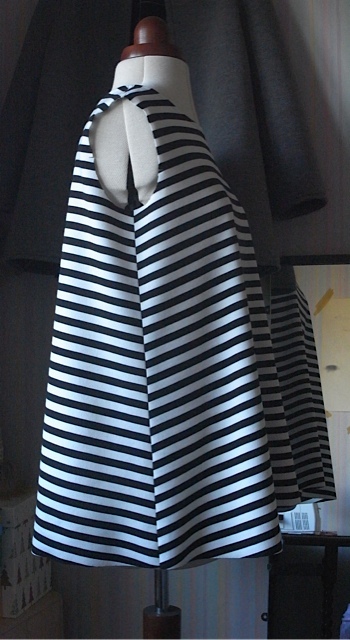 I again just zig zagged the hem to finish. 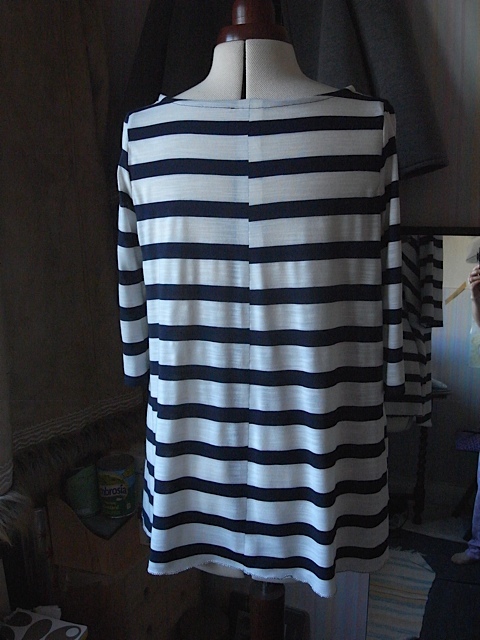 Another lovely comfortable stripy to wear, me happy :0) This one is a very dark navy and a sort of off white/cream. I said in January that I wasn’t going to make multiples of the same pattern but what can I tell ya? When I like something I like something and I want lots of it! 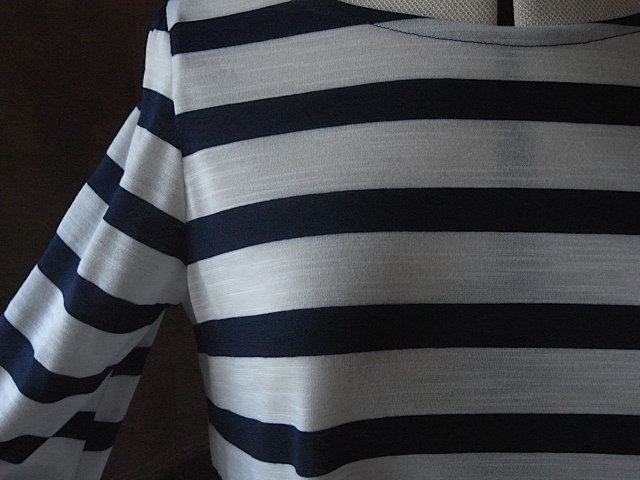 So here comes a stripy Trapeze top in the most wonderful jersey fabric ever. I remember also, saying back last year that I didn’t like working with jersey so just goes to show you can’t believe a damn thing I say! This jersey though was a dream with. Didn’t slip and slide all over the place and wasn’t floppy. It stayed where I put it and pining and sewing was so easy. I must get some more. I’m rather pleased I have to say with the pattern matching on this top. Its not perfect by any stretch but is a damn sight better than the tartan. 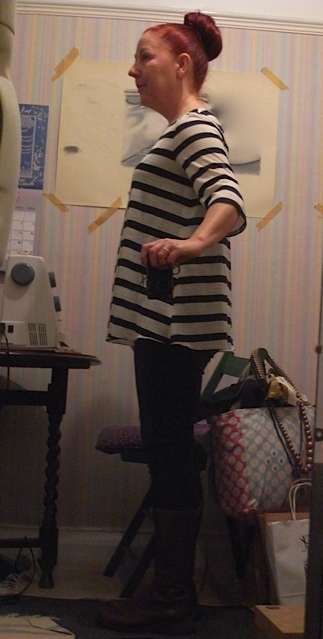 As you can see, I couldn’t fit the sleeve pattern piece in its entirety on the fabric, so I have shorter sleeves on this top. And I couldn’t fit the neck facing on the fabric either, luckily it wasn’t needed anyway. 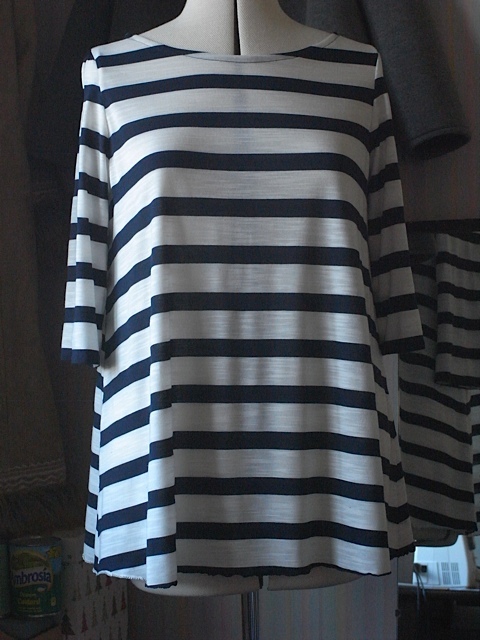 Slightly mismatched stripes on this side. But better on this side. Center back seam not too bad either. 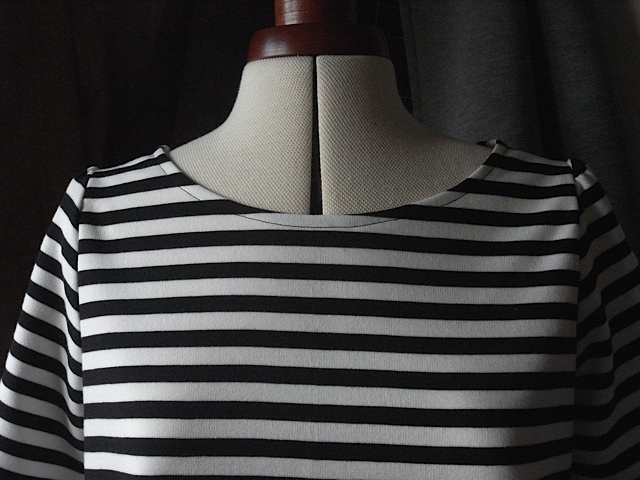 For the neck, I simply folded the edge over 1.5cm and top stitched down. Works really well. Nice neat finish. 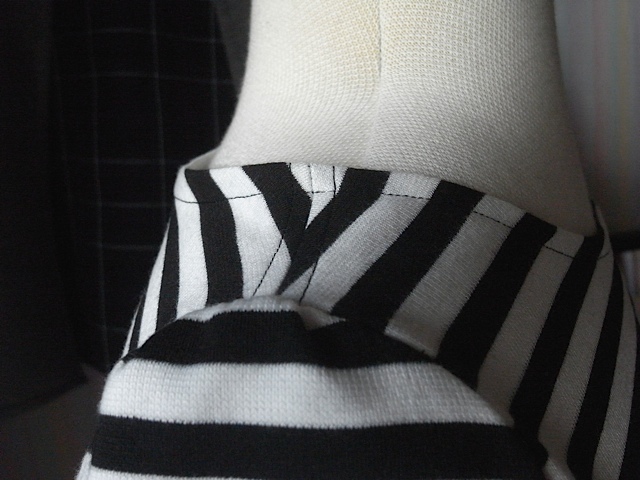 Not so well matched shoulder seam. 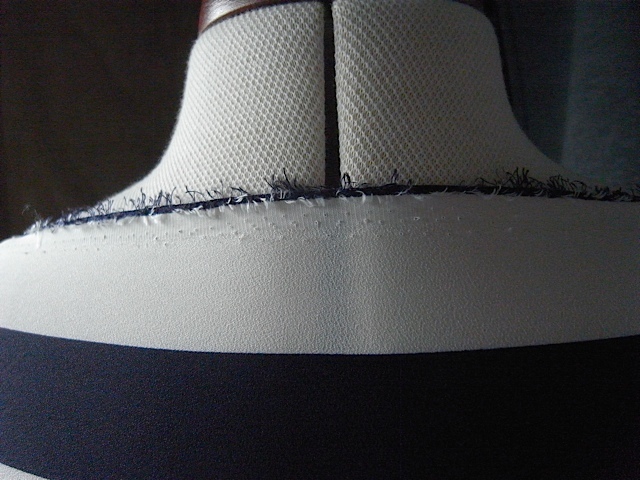 I also top stitched down the shoulder seam allowances so they would lay flat. 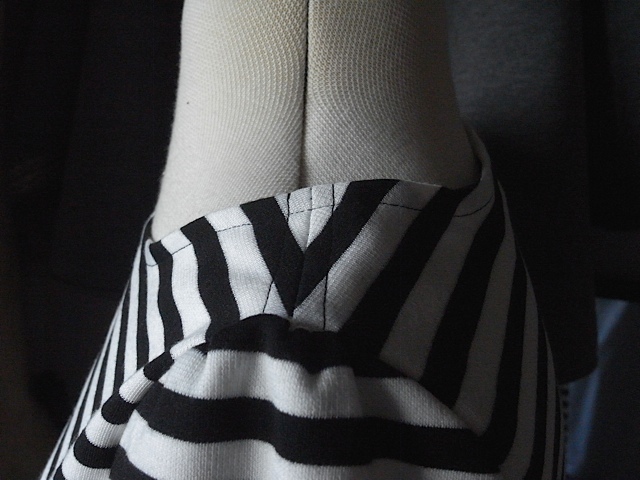 I zigzagged the hem edge again. This is proving to be quite a successful finishing technique. My favourite thing about this top is that it only took me 4 hours to complete. From cutting out the fabric to finishing the hem. And that my friend is the magic of jersey. No seam finishing and no need for neck facings make for a really speedy process. And its satisfying too. I love this fabric. 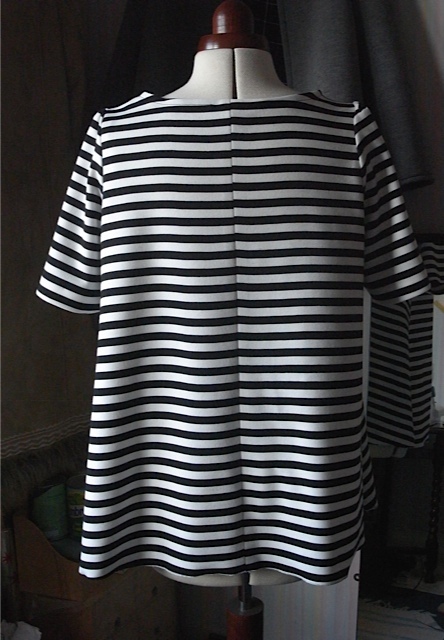 Its comfortable to wear and doesn’t need ironing after washing. What more can I say? What more can we want? 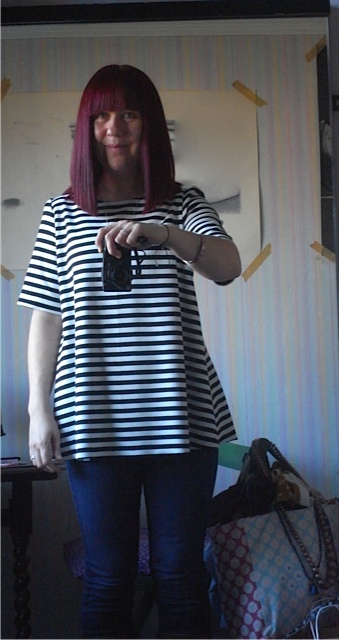 Just wanted to share my new hair do, and how I wore the top for a day out yesterday to London and afternoon tea.